The “Character Set” dialog (in “Text” Menu → “Character Set”) shows all the characters available in the font you are currently using. Clicking on a character will insert it at the spot where you cursor is placed. With the Page drop-down menu, you can set which part of the character set you would like displayed. 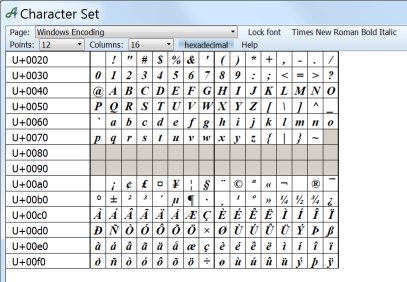 In addition to the standard encoding options, you will find font sets for a variety of languages, as well as options for Unicodes. Be aware that most fonts do not contain all the possible characters. If your current font does not contain a specific character, Papyrus will display a small, white rectangle in its place (such as in number 127 in the picture above). When you choose the option “lock font,” the font you have displayed will remain in the window, regardless of what font you click on in your text. 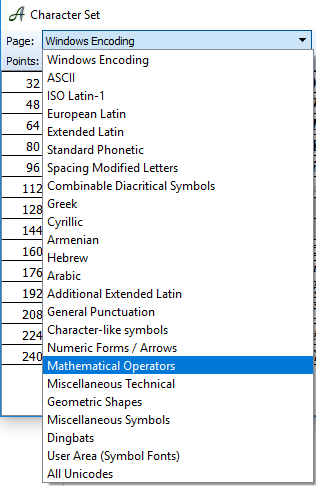 This allows you to have access to special characters your current font is missing. Like many other Papyrus dialogs, the character set dialog is non-modal, meaning you can leave it open while you continue to work on your text. The font size option in this dialog is only valid for the window display. Adjusting the font size here will not adjust it in your text. The “Columns” drop-down menu allows you to set how many columns you would like to see next to each other.